You don’t have to live an extremely frugal lifestyle to save money on your home, or on your utility bills. There are plenty of little things you can do to save money on your utilities. Your utility bills are one of those grin and bear it types of monthly payments. They’re expected, sometimes anticipated BUT rarely appreciated. Well, rather than suffer in silence, there are real steps to start saving money on utility bills. No, not the temperature in your home, the temperature on your hot water heater. The less your hot water heater has to work, the more money and energy you save. Wash your clothing on cold or warm, use the recycle option on your dishwasher and only run it when it’s full. Take shorter showers and stop leaving the faucet running. The more your water heater has to heat the water, the more money you’re spending. This is of course only applies in the cooler months. The heat from the sun’s rays can warm your home five, ten, sometimes even fifteen degrees, depending on the time of day. This can save your furnace a lot of extra effort and energy. It’ll also save you good money each month. During the summertime, keep the sun’s rays out to keep your home cooler. Any appliances that use electricity or gas should be maintained. That includes your refrigerator, hot water heater, furnace, air conditioner, stove, and even your grill if it runs off of your gas line. Make sure they’re in good operating shape. Make sure you’re not losing energy or efficiency. This means regular cleaning and routine tune-ups. Run your heat-generating appliances during the evening. During the warm summer months, try not to run the dishwasher, stove or washing machine during the day. They kick out heat when they’re running and that makes your air conditioner have to work extra hard. During the winter months, however, you can capitalize on household chores to help heat the home. When your appliances and electronics are turned off, they still use energy. In fact, they use a lot of energy. It’s said that if everyone unplugged their computers and laptops at night they’d save enough energy to power 100,000 homes. Experts say if you eliminate your phantom load, you can cut your energy bill by 10%. That’s a pretty significant saving, particularly when you look at the savings over time. Plug electronics into smart strips and turn off the strip at night. Many of the recommendations for saving energy still hold true. You can save a ton by getting a programmable thermostat, turning off the lights when you leave the room and by adjusting your thermostat to save energy. 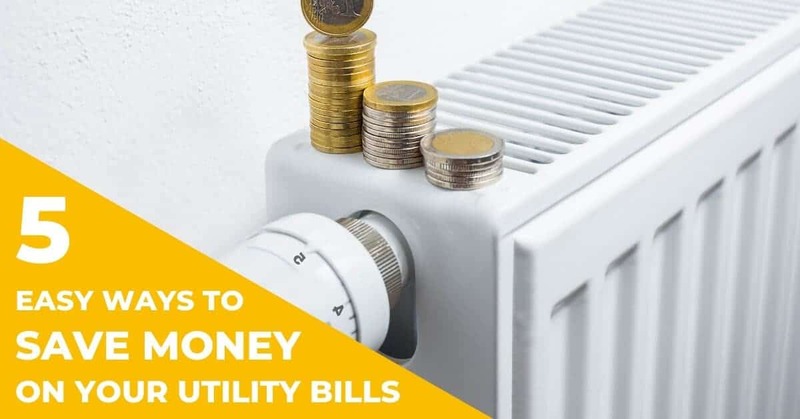 These additional tips and steps will help you take your money further and lower your utility bills year round. If you found these money saving tips helpful, please share them on Pinterest! And if you’re looking for more money saving tips, please follow our saving money board!